The usage of fine grinded silicate glass as an active additive to Portland cement has been considered in order to substitute neat cement in the cement composition, just as it is in EN 197-1 European standard by the example of active mineral additives of natural and artificial origin. Zhu H., Chen W., Zhou W. and Byars E.: Materials and Structures, 2009, 42, 485. Schwarz N., Dubois M. and Neithalath N.: Cement & Concrete Composites , 2007, 29, 656. Lin K., Huang W., Shie J. et al. : J. Hazardous Mat., 2009, 163, 916. Sobolev K., Turker P., Sobolewa S. and Iscioglu G.: Waste Management, 2007, 27 , 971. Zainab Z. and Al-Hashmi E.: Waste Management, 2009, 29, 655. Batayneh M., Marie I. and Asi I.: Waste Management, 2007, 27, 1870. 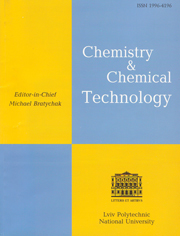 Shevchenko V.: Glass Physics and Chemistry, 2012, 38, 466. Deja J., Golek L. and Kolodziej L.: Cement Wapno Beton, 2011, 6, 349. Shi C., Wu Y., Riefler C. and Wang Y.: Cement and Concrete Research, 2005, 35, 987. Schwarz N. and Neithalath N.: Cement and Concrete Research, 2008, 38, 429. Park S., Lee B. and Kim L.: Cement and Concrete Research, 2004, 34, 2181. Shayan A. and Xu A.: Cement and Concrete Research, 2004, 34, 81. Myasnikova E., Gumen V. et al. : [in:] Pashchenko A. (Ed. ), Teoria Cementu. Budivelnyk, Kiev 1991. Taha B. and Nounu G.: Construction and Building Materials, 2008, 22, 713. Schwarz N., Cam H. and Neithalath N.: Cement and Concrete Composites, 2008, 30 , 486. Chen G., Lee H., Young K. and Yue P.: Waste Management, 2002, 22, 747. Shevchenko V.: Glass Physics and Chemistry, 1987, 13, 293. Spiering G. and Stein H.: Cement and Concrete Research, 1976, 6, 265. Shevchenko V. and Swierad V.: Chem. & Chem. Techn., 2007, 1, 179. Shevchenko V. and Kotsay G.: Vopr. Khim. i Khim. Techn., 2013, 1, 163. Shevchenko V.: Visnyk Lviv Polytechn. Nat. Univ., 2013, 755, 462. Tashiro C. and Kawaguchi Y.: 6th ICCC, Russia, Moskwa 1974, 227. Shevchenko V. and Kotsay G.: Chem. & Chem. Techn., 2014, 8, (in press).